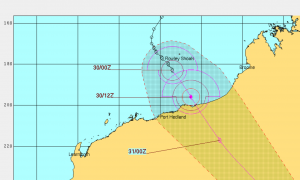 Tropical Cyclone Stan at 00UTC 30 January was located about 120 NM north of Port Hedland, Australia and was moving south-southeast at about 4 knots with max winds of 60 knots. Forecast suggest that Stan will reach 70 knots wind speed by 12UTC 30th just prior to making landfall. This entry was posted in Tropical Cyclones and tagged Hurricane, South Indian Ocean, Tropical Cyclone. Bookmark the permalink.